The top White House contenders are a lot richer than the rest of us. Here's where they got it...and where it goes. 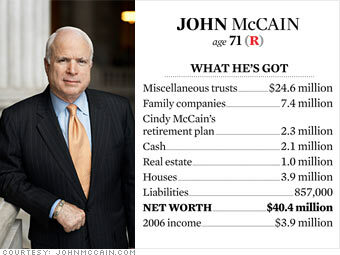 McCain wouldn't exactly be poor were he on his own. As a senator he earns $165,200 a year, and he has a $54,000 Navy pension. And then there's publishing. "Faith of My Fathers," his autobiography, was on bestseller lists for 24 weeks in 1999. Since then he has produced about a book a year, recently "Hard Call," about good decisions and how historic figures made them. In 2006 he took in about $225,000 in royalties, but over the years, income from books has totaled about $1.7 million, all of which he has donated to charity. He can afford to be generous. His wife Cindy is the chairman of Hensley & Co., the Anheuser-Busch beer distribution business she inherited from her father. As an only child, Cindy is in charge of the family trusts. Although she only has to report that she has a salary of $1,000 or more, her income from investments in 2006 came to about $3.7 million. Except for checking accounts, all the McCain assets are in Cindy's name or those of their dependent children. Nearly $5 million sits in two generation-skipping trusts. She receives the income, but the principal passes to her heirs. One holds mostly J.P. Morgan mutual funds and Anheuser-Busch stock, while a second trust has only Arizona municipal bonds. Other trusts that benefit Cindy contain a variety of stocks, bonds and mutual funds. She also owns shares in two large medical buildings in Phoenix, a guesthouse near the couple's home in Sedona and an investment property in Coronado Beach, Calif.
Another $6 million in J.P. Morgan funds is held in the name of their four children. In the Navy, McCain no doubt learned to keep things tidy, and the couple's finances are shipshape. They - and Cindy's father - "have clearly given a great deal of thought to their estate," says Christopher Cordaro, wealth manager at RegentAtlantic Capital. Cordaro has just one worry: "Everything except $50,000 is in her name or in trust for her and the children," he says. "I'd advise the senator to keep Cindy very happy - or have a good prenuptial agreement."